The impact of Hurricane Irma was felt across Orange County in September 2017. The first Category 5 hurricane of the 2017 Atlantic hurricane season certainly made its mark with local residents as it funneled to the top visited news story on Orange County Government’s online newsroom and companion OCFL News app. From Amazon’s 1,500 job announcement to helping man’s best friend find a new home, news stories on the economy, health and public safety were the most widely read stories by Orange County residents in 2017. As home to more than 1.2 million residents and a top destination for more than 68 million travelers and tourists from around the world, Orange County Government provides breaking news and information about the region through its pioneering online OCFL Newsroom and free mobile app. Orange County’s website had more than 62 million page views in 2017. With its strong digital presence, and for the third year in a row, the National Association of Counties recognized Orange County Government as one of the top 10 U.S. counties in its 2017 Digital Counties Survey, highlighting its digital communications. Additionally, the Ash Center for Democratic Governance and Innovation at the Harvard University’s John F. Kennedy School of Government recognized Orange County Government’s Digital Media Transformation as part of its 2017 Bright Ideas in Government initiative. In addition to its newsroom and updates on Facebook, Twitter, Instagram and YouTube accounts, the County’s OCFL 311 and OCFL Alert emergency mobile apps helps keep citizens apprised of emergency and weather notifications. Here is a look at the top five articles featured in Orange County’s Newsroom and the OCFL News mobile app in 2017. Orange County Government encouraged residents to prepare for Hurricane Irma and continued to monitor updates from the National Hurricane Center. Mayor Jacobs and Orange County Fire Rescue broke ground on Fire Station 67 in September. This was the first Orange County fire station funded as part of Mayor Jacobs’ INVEST in our Home for Life initiative. Summer months include the peak breeding season among homeless and stray animals. Orange County Animal Services felt the full impact by nearing capacity and placed a call that adoptive homes were urgently needed. In July, Amazon.com, Inc. announced plans to open a new fulfillment center in Lake Nona. When the site opens in 2018, Amazon will create 1,500 new full-time jobs with benefits. In May, Orange County Mayor Teresa Jacobs and the Orange County Parks and Recreation Division celebrated the groundbreaking of the Deputy Scott Pine Community Park with numerous dignitaries, guests and the law enforcement community. To learn more about Orange County’s newsroom, click here. Local residents are also encouraged to read Orange County Mayor Teresa Jacobs’ Year in Review on Orange County’s website. Photo Caption: Mayor Teresa Jacobs and Florida Gov. 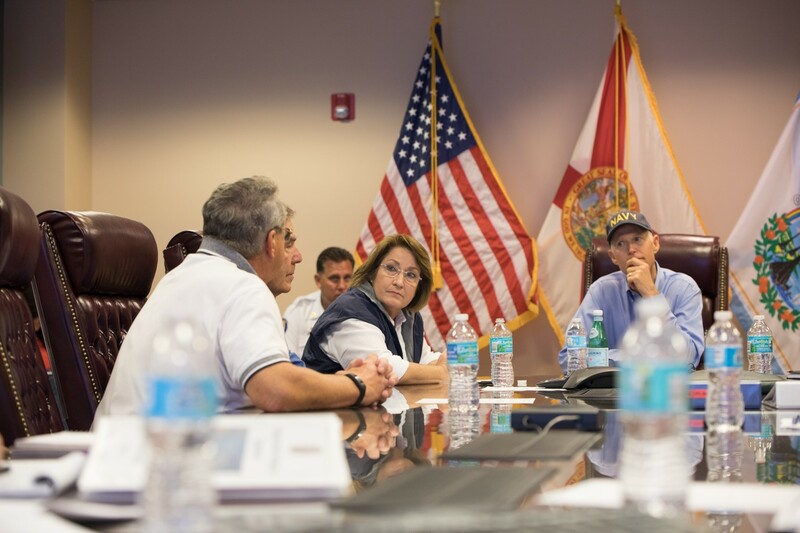 Rick Scott discuss safety measures at a policy briefing at Orange County’s Emergency Operation Center before the Hurricane Irma made landfall on Sept. 11, 2017.